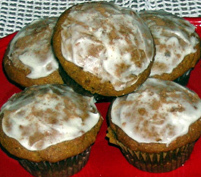 Each cupcake contains two grams of healthy Omega-3 fatty acids from canola oil, flax seed, squash, and walnuts. Eggs may or may not be high in Omega-3’s depending on how the hens are fed. A good reason for free range hens to have a mixed diet that’s high in greens. I developed this recipe after reading Susan Allport’s excellent book “The Queen of Fats: Why Omega-3s Were Removed from the Western Diet and What We Can Do to Replace Them”. Servings: Makes 12 cupcakes or one tea loaf. Preheat oven to 350°F. Oil and flour 9×5 inch loaf pan. For cupcakes prepare 12 slots. I use paper liners in my tins to avoid oiling and flouring. Sift first 7 dry ingredients into medium bowl. Using electric mixer, beat oil with sugar and then beat in eggs 1 at a time. Beat in pumpkin, flax seed and vanilla. Add dry ingredients to pumpkin mixture alternately with milk, beating after each addition. Stir in ginger and nuts. Transfer batter to prepared pan or cupcake tins. Bake loaf cake until tester inserted into center comes out clean, about 50 minutes. Cool in pan on rack 15 minutes. Turn cake out onto rack; cool completely. Bake cupcakes for 25 minutes or until tester comes out clean, they will still look barely moist on top. Let cupcakes cool in pan for three minutes before transferring to a cooling rack. Combine ingredients and mix until smooth. Lightly spread on cooled cupcakes or loaf. I dusted my glaze with a small pinch of Vietnamese cinnamon on each cupcake. *Vietnamese cinnamon is very dark and fragrant. For many years it was unavailable in the US but now that trade has resumed with Vietnam, we have access to what is considered the finest baking cinnamon. **Baker’s Cut Ginger, is minced candied ginger. A real step saver, no more sticking to the knife or gnarling up in the food processor. The last few years I’ve noticed a flock of wild turkeys clustered on Albany, Oregon street corners like wayward youth. I half expect to see cigarettes dangling from their beaks. Local news recently filmed wild turkeys in Eugene, OR, perching on roofs, digging in gardens, and lending a touch of wildlife. In general they are seen strutting their stuff and of course are safe and well fed in city limits. The neighborhood was split between those who would like to be rid of them and those concerned they might not be getting enough to eat. The topic of wild turkeys came up in two garden talks this last year and I learned a bit from my audience. Gardeners don’t seem to like these turkeys in their garden. They eat most of what grows and leave a mess behind. Furthermore, I now know wild turkeys are not native to Oregon but are a transplanted subspecies from the Rio Grande valley that has adapted well or another subspecies, the Merriam’s turkey, native to the Ponderosa forests of New Mexico, Colorado, and Arizona. As with most non-native game introductions this is done to facilitate hunting. Here’s a quote from the Oregon Dept of Fish and Wildlife. “Wild turkeys provide significant recreational opportunity and economic benefit to Oregon residents. During the spring 2003 season, 14,152 hunters pursued wild turkeys in Oregon.” If you want to read more please go here. A very happy Thanksgiving to you from all us at Nichols Garden Nursery. There is much to celebrate including the bounty of our gardens. Our table will be graced with a well stuffed turkey along with other foods of the Americas. Much the same menu as I posted in 2006, although we’ll add green beans this year, and skip the potatoes. A customer from Meridian, Idaho writes to us about controlling weeds and I thought I’d share her questions and my suggestions. This layered method for weed control is effective and improves your soil. Pat Lanza wrote an excellent book a few years ago titled Lasagna Gardening. “I am have a terrible time in my garden with weeds. It is a fairly large garden and we irrigate (definitely a source of the weeds) We have to create rows for the irrigation. It is hard to mulch because of the irrigation. Do you have any ideas for me? I try to stay away from chemicals in the garden and I add lots of aged horse manure.” L.C. Answer-We have similar problems here with weeds and trying to suppress them. My first strategy is to use drip or leaky pipe irrigation; it conserves water and you’ll only supply water to the plants you want to grow. The second part is use several layers of newspaper as mulch. If you don’t want to see the newspaper cover it with your horse manure and put a layer of manure on the soil as well. The newspaper excludes light and the manure will break down and enrich the soil. Next season you will have a relatively weed free area to plant. Don’t till, as you’ll expose weed seeds, just dig planting holes. Start this process over the winter as you have breaks in the weather and you’ll get a jump on spring weed growth. When using horse manure be sure to keep your tetanus shots up to date. “Thank you for the quick response. I have been reading about the newspaper mulch and was thinking about it. I am assuming that there is no issue with the ink from the paper. I never hear mention of it. Thanks!” L.C. As we move into cooler weather I see our salad garden is a bit uneven. We have lots of greens for cooking, mesclun, racdiccio and arugula but sometimes I begin to crave a crunchy salad that’s packed with flavor and color. So I broke down and purchased some lovely local Romaine lettuce. The garden pantry contributed radiccio, which we cut at the soil line instead of pulling because the plants often produce a second head. In spite of some near frosty nights we still have some of my favorite edible flowers. Nasturtiums add color, a wonderful fresh peppery bite and the anise hyssop echoes the tarragon with it’s own sweet anise flavor. Each anise hyssop flower head is actually dozens of tiny flowers that I stripped from the stem. Mild flavored calendula petals are twisted away from the head and sprinkled like confetti over the greens. I gathered about one cup edible flowers not packed, this was about eight nasturtium blossoms, 2 flower heads of anise hyssop, and half a dozen calendula flowers. Always use flowers that are not sprayed with chemicals. Rinse, dry and tear salad greens into bite size pieces. The tarragon leaves can remain whole. Mix dressing ingredients and toss with greens. Add salt and pepper to taste. 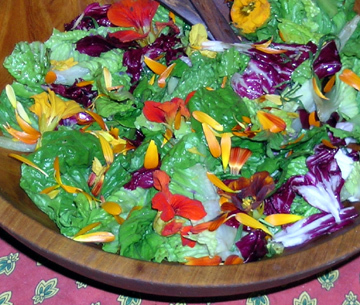 Sprinkle the flowers over the salad greens, do not toss and serve. Serves 2-4. Today I made “essence of tarragon”. To do this, cut the plants back, carefully rinse the foliage, spin or shake away excess moisture and strip leaves from the stem. Pack the leaves into a jar and cover with hot white wine vinegar or rice vinegar. I store this in a cool pantry and that’s it. After it sits for a few days the vinegar becomes a richly flavored and aromatic concentrate of tarragon. Add small amounts to salad dressings, tartar sauce or use for any of your favorite tarragon recipes. I like to mix a teaspoon into two tablespoons of Dijon mustard and coat a chicken inside and out before roasting. Balsamic vinegar, fresh chopped tarragon and minced onion combine complimentary flavors in an easy winter salad. When roasting beets leave 2” of stem so they don’t bleed. When they have cooled trim and remove skins. In England, I’ve seen ready to go plastic pouches of whole roasted beets which seems like a great convenience. 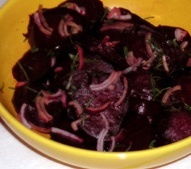 Our garden beets are left in the ground during winter and gathered as we need them. We usually stirfry the greens as a separate dish. Tarragon is one of my most easily grown herbs. I say this because it wasn’t always this way. Our home garden soil tends to be wet and cold in winter. 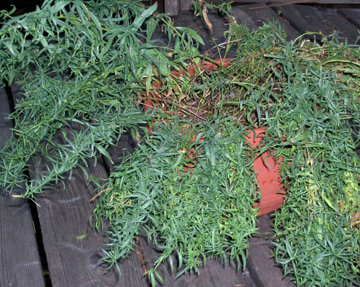 Tarragon dies back in winter and is often the slowest plant to reappear in late spring. After a particularly cold wet winter we may not see it at all. The photo below was taken in early November shortly before harvesting. The solution is to grow it in a container. Drainage when using potting soil is no longer a problem, the container warms early in the spring and you’ll harvest tarragon all season. Best of all, if you have a division or a small container bring it indoors in January when foliage has died back and soon vigorous delicious shoots will appear.